A pair of "cold and calculating" thieves have been jailed after waiting for their victims to walk the dog before breaking into their Northampton home. Kieron Long, aged 33, and 45-year-old Wayne Brown, both from Kingsthorpe, were arrested following the break-in at a property in Brackley Close, Sunnyside, on March 16, where they stole over £1,400 of cash and belongings. Kieron Long and Wayne Brown have been jailed for burgling a Northampton couple's home. 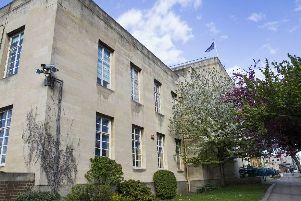 Northampton Crown Court heard on Friday (April 5) how the pair hid behind a bush and watched as the couple left their house to walk their dog at 8am. Once the couple was out of sight, it took the pair just half-an-hour to break into the home, steal whatever they could find and run from the street. The victims knew something was wrong when they smelled cigarette smoke in their home. In total, the pair stole a handbag, a jar of coins, £700 cash, a lady's watch, a mobile phone and a valuable box of cigars. Kieran Long broke into the couple's house after making sure they were out of sight. But Long and Brown didn't know the entire incident was caught on CCTV, and they were arrested within days. Long was also spotted bringing two stolen cars to a Northampton garage and asking for two of the "good tyres" to be replaced with "bad ones" so he could sell the better ones later. The garage instead called the police afterwards. Meanwhile, police also found Brown in possession of an Amazon Fire he claimed he found. But the tablet was really the beloved possession of a distraught little girl who had lost it in a burglary, during which the couple's car was also stolen. The little girl was delighted to be reunited with the tablet following Brown's arrest. Wayne Brown kept lookout while his co-defendant broke into the house and let him in. The court heard how both men had multiple previous convictions for burglary and used the money they stole to feed their drug habits. His Honour Judge Michael Fowler told the pair: "It's obvious that you have struggled with drugs throughout your lives. But you cannot go on committing offences playing the card of being involved in drugs and avoid serving sentences. "If you want to stay out of prison, then stop committing offences and deal with your drug problems." Long was handed a 16 months prison sentence, while Brown was sentenced to 12 months in jail. A child's Amazon Fire tablet was also found by police, which was returned to the delighted little girl. The arrest was the work of a new Northamptonshire Police burglary team. Speaking outside court, DS Terry Rush, from the Force's burglary team, said: “This was great work by the team dedicated to tackling burglary across Northamptonshire. These two men are prolific offenders who pose a significant risk to the public but who have now, thankfully, been taken off our streets."